In Police Quest: Open Season, the movie theater proprietor with a stutter turns out to be a cross-dresser and the murder. 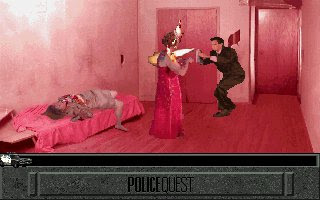 At the end of the game, Detective John Carey lights the killer on fire using hairspray and a lighter. The sense can be viewed here (at 3:16:00), but *content warning* it includes transphobic violence. On some sites it is claimed that the protagonist Detective John Carey’s ex-partner (who has been murdered) was a cross-dresser, though other reviews suggest the partner was possibly transgender. However, some discussion suggests this is not the case. Similarly, there is debate as to whether the “transgender bar” and “gay records in the music store” (which some authors have claimed as LGBTQ content) actually exist. Neither reference shows up in walkthroughs and is not evident in this full playthrough. Both might actually refer to this character who appears outside of those spaces. Moreover, the references to discovering Carey’s ex-partner was a cross-dresser might actually be in reference to learning about the killer (see above). This entry was posted in 1990s, Cross-dressing, Gender non-conforming, Homophobia/Transphobia, Transphobia on August 26, 2015 by Adrienne Shaw.